The final Sketchup design I made for the group. Interview with Dan Thurber to get ideas. In this project, we were given the opportunity to tackle a big issue here at Animas: our run-down building. 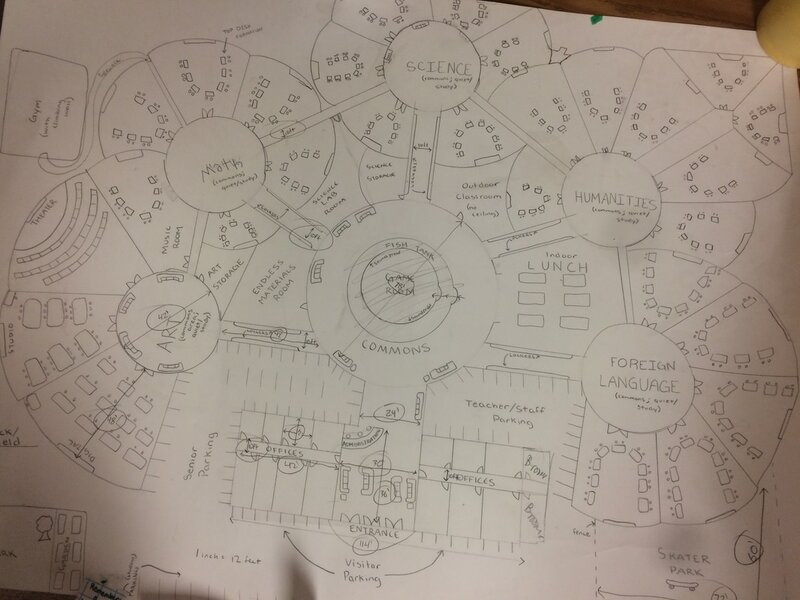 We worked with assigned group to come up with a final school layout/design that we would be proud to call our high school. We had to create a budget/materials list, a 3D rendered design of one detailed room, a layout of the entire school in Sketchup (with dimensions), a layout of our detailed room (with dimensions), and a final proposal for the Board of Directors. We were tasked with being creative, analytical, and making our building sustainable all at the same time. At the end of the project, we had to come up with a final poster that included all of this. I learned more about Sketchup and Photoshop than anything in this project. 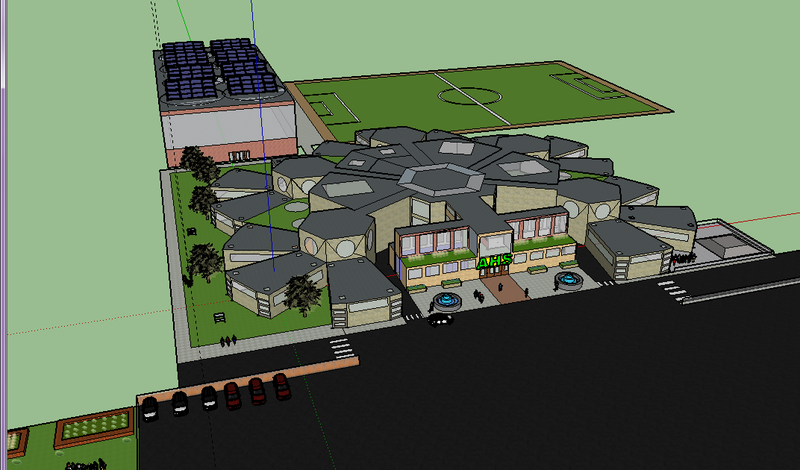 It really sparked an interest with me when designing and creating the 3D school. It makes me consider going into a field of architectural design. For example, when I was making the school in Sketchup, specifically boosting everything up to make it 3D, it made me so excited to see this amazing design that was once on paper, come to life. It was amazing and I got very excited! I also learned about human-centered design in this project. It opened my eyes and ears to things I had never been exposed to in previous years. I had never thought about what makes a building functional or why schools were set up the way they are. It made me pay for attention to the detail of buildings and helped me notice the things that are causing success and causing failure in our building, in particular. One example of this was when I was just watching TV at home. I began to look around and notice that the wall by the kitchen was too short, causing it to feel small in the living room and that the colors in here were maybe too dark. Just little things like that. In my group, I have definitely grown as a leader. I have always stepped up as the leader of groups in the past, but this project really took me out of my comfort zone and helped me refine those leadership skills. In particular, it helped me trust other people to get their work done. That is definitely something I struggle with. In this project, there was a point when we were assigning jobs and I wasn't trusting of my teammate to take responsibility of the proposal, but I knew I had to let it go to get the project done on time. It worked out in the end and turned out fine! I grew in the area of shared responsibility! Although I feel successful in this area, I feel I could've done better with accepting and incorporating other's ideas into our design. The final design we used was based off of a prototype I came up with. I don't know if my group members were really okay with this or if they felt that they couldn't present new ideas. I hope to grow in this area in the coming years. When it comes to designing this new school, I think it is very smart and successful to get the kids involved. After all, they're going to be the ones who use it the most. A school is a place that needs to feel safe, but open, creative, but focused, and feel student-driven, but also disciplinary. There are so many components to creating a productive school and so many of the problems with our current school could be easily solved by the ideas floating around in the student's minds. Something that might seem logical for the teacher, might completely mess up the way a particular group of students learn. It's a balancing act, but you need to hear all user's voices to get it as close as you can to perfect. This makes me think of the time, during this project, when we were trying to figure out what could make all users content with our design. We were pretty stumped until we were presented with the idea of "Empathy Interview." An empathy interview is where you ask a user questions, but make it feel more like a conversation rather than an interrogation. Anyways, this was very successful for us and opened our eyes to the values our school needs to include. All the user's voices helped us find our true campus values.